Child Care Council of Suffolk, Inc. is the not-for-profit planning and coordinating agency dedicated to making child care work for all of Suffolk County’s diverse communities. Through advocacy, education and resource and referral, the Council takes a leadership role in supporting children, families, providers, employers and the public to ensure that quality child care takes its place as an integral part of society. A vision for a Child Care Council in Suffolk was conceived long before the defining reality. A group of dedicated child care professionals incorporated and operated in a limited way as the Day Care Council of Suffolk, Inc. in 1972. The group functioned primarily as a coalition of child care providers who shared information and advocated for policy and legislative changes. Working out of a tiny attic room at the Bay Shore Day Care Center, the agency amended its Certificate of Incorporation, thereby changing its name to the Child Care Council of Suffolk, Inc. (CCCS) on December 30, 1983. With founder Janet Walerstein at the helm, CCCS rapidly expanded over the succeeding decades through the acquisition of corporate and foundation funding, New York State Legislative grants and county funding administered by Suffolk DSS. In 2011, the Child Care Council of Suffolk became only the second agency in the nation to achieve National Quality Assurance Accreditation – establishing CCCS as one of the leading child care resource and referral agencies in the country. 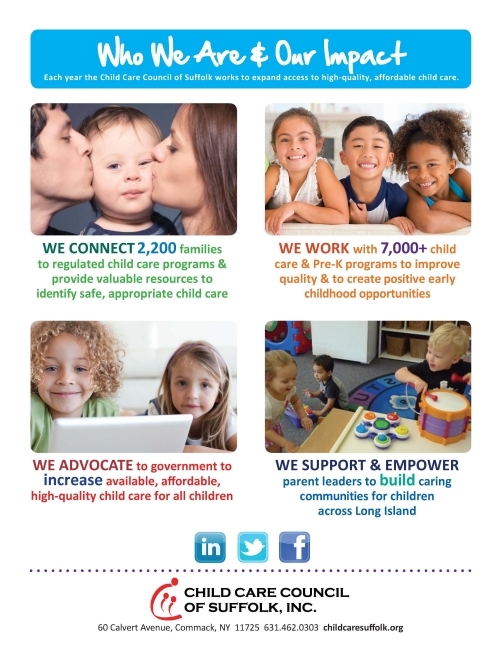 Today, the Child Care Council of Suffolk remains the leading educational resource and referral service and advocate for quality early care and education to become an integral part of society for the children and families throughout all of Suffolk County’s diverse communities.